When do you update this thing? It changes according to my (outside of art life) schedule but I try to make it once a week. The comic updates in batches. Check the front page announcements for the update schedule at the moment. How do you read this comic? This is a story that focuses on a set of characters (see Cast), explored via 3 layers: Detective Grimsley’s individual cases, each character’s backstory/slice-of-life interactions, or/and a central slow-burn plot. The archives are organised hierarchically, from Volume -> Chapter -> Chaplettes. Think of it as a TV show, with seasons, B-plots and an ensemble cast. Or like a long-running manga. 4, containing approx. 100 stories. We are at Volume I currently, with 7 Chapters. >What is the difference between Chapters and Chaplettes? Chapters contain major plot points or rather big cases, and have more or less over 60 pages. Chaplettes are (very) short stories* squashed in between Chapters, for character development and world-building and as an outlet for experimenting. It’s not necessary to read ALL of the Chaplettes, but it’s always important for insight and a better understanding when a Chapter happens. *the backstory chaplettes are pretty big. What art software/program(s) do you use? Photoshop CS6. A Huion tablet. Kyle Webster brushes (Mr Natural Brush mainly). How is this comic done? It depends, but I would call it a mixed media comic. This comic allows me unlimited creative freedom on how I want to approach a story, so one chaplette can be entirely drawn in pencil, and the other drawn digitally, and the next can be both (imagine, a collage comic). The only things that are constant are that I write gibberish on the computer, and do thumbnails on paper. What is the genre of this comic? I’ve no idea actually because the genres covered by TWiDI are extremely broad. It’s not strictly horror, mystery and fantasy. The closest I can get is a hybrid between occult detective fiction, gothic satire, cozy whimsy and urban fantasy. I started it around March 31st, 2010 and launched it on March 30-31st 2013. I’ve the appearance of a millennial. 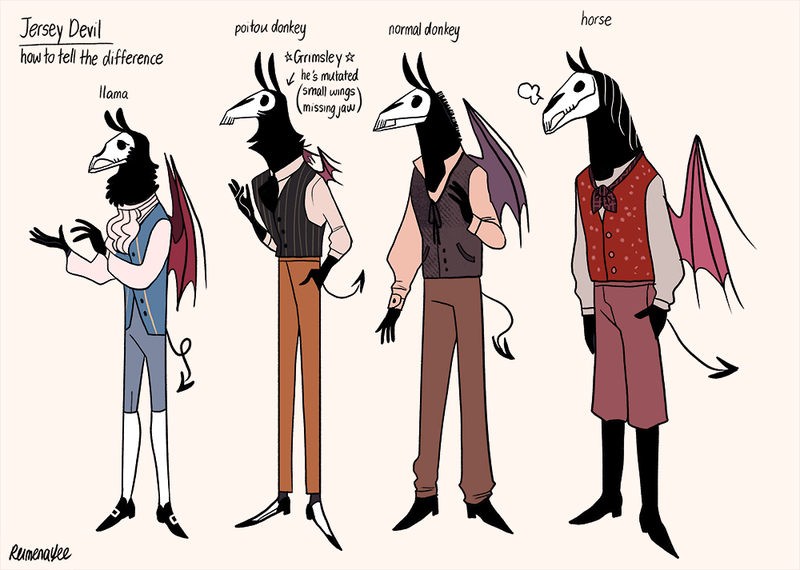 Grimsley is a Jersey Devil, with the skull and appearance of a donkey. He originated from a brood that was displaced from America some decades before his birth. I’m aware that immigration has always been part of human history, and that attitudes towards foreigners don’t necessarily look like the attitudes we’ve today. So there will be a diversity of faces wherever the setting is, even if they are the minority. The main setting, Brookham, is a port town which faces France, so there is a lot of cross-channel movement, and a flourishing immigrant population. The characters, except Bronx and a few, are predominantly in the ace spectrum. They have varying attitudes towards sexuality and romance, but the main thing between the main cast is that they love each other platonically (this is a key message of TWiDI: the beauty and importance of non-sexual/non-romantic friendship). As such I’m very happy to admit that this is an ace comic, even though I won’t even talk about it at all. It’s just the general vibe. A lot of diversity which I haven’t yet drawn or written will come in their own time. I personally don’t want to make a big deal about its inclusion, even though I understand how important diversity is and I talk alot about non-Americanised representation. 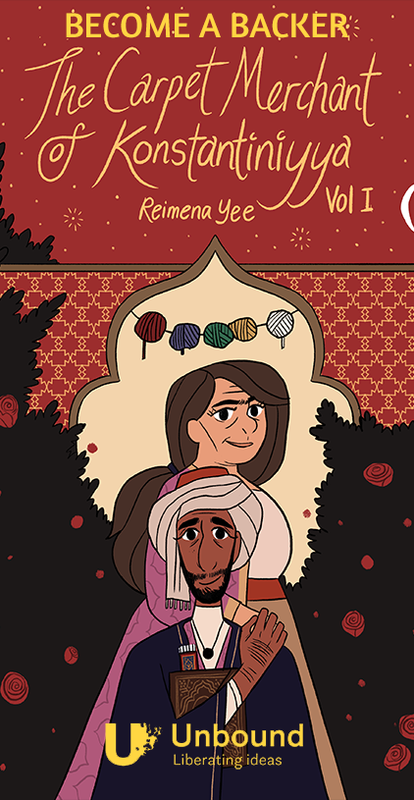 TWiDI is written and drawn by a Southeast Asian (Malaysian Chinese) raised in a multicultural society that barely has white people in it, where Christianity is a minority religion, and where culture/race/religion are blurred. I’m ace (not averse), and I’m feminine-presenting and call myself a girl for convenience but otherwise don’t really care. That’s all you need to know about me.